This article was originally published in the Spring 2003 issue of Namarupa magazine. I frequently see patients who believe that they have difficult lifelong physical or emotional patterns resulting from trauma suffered in utero or during birth. Often they feel a sense of hopelessness about changing these patterns. Combining two concepts in Ayurvedic philosophy may point a way to address such maladies. These two concepts are Brahmamuhurta, the pre-dawn and dawn hours, and the concept of the relationship of the macrocosm with the microcosm. Let us look at each concept, individually, and then how combining the two may lead us to a therapeutic approach to certain disorders that may arise. Brahmamuhurta is the name for the early hours of each day. There are varied opinions about exactly which hours constitute brahmamuhurta. The commentary on the above passage from Astanga Hrdayam, one of the foundational Ayurvedic texts, states that the hours of brahmamuhurta are the “last three hours of the night (from 3am to 6am)”. Amitabhan, author of the article “Wake up Before Dawn” and associated with contemporary saint Amritanandamayi Ma (Ammachi), says it covers “the one and a half hours before sunrise,” when the sky has a “rosy-red hue. A few stars may also be visible.” The tradition associated with Sivananda Yoga says it begins at 4am. The tradition of Surat Shabda Yoga includes 3am through dawn in the amritavela; “elixir” or “ambrosial” hours, as brahmamuhurta is also known. As this is the tradition into which I am initiated, this is the time span I will consider in this exploration. From Ammachi to Swami Sivananda, to my own lineage and even to Christian traditions, these “ambrosial hours” are emphasized as being the best time for meditation and prayer. The Astanga Hrdayam teaches that they are also ideal times for “study and [to] obtain brahma or knowledge”. Often the reason given for why this time is so ideal for meditation and obtaining knowledge is that the outer environment is serene and the mind is quieter at this time and more inclined within and less inclined to feel it is missing out on important jobs of the daylight. Dr. Vasant Lad also tells us that, “At this time, there are loving (sattvic) qualities in nature that can bring peace of mind and freshness to the doors of perception”. Aside from these reasons, there may be other reasons to appreciate brahmamuhurta. If we explore how it relates to the law of microcosms and macrocosms, we might see how we can take advantage of brahmamuhurta to lead to increased health and peace in our lives. The above is a succinct explanation of the Law of Microcosm and Macrocosm. If everything that exists in the macrocosm exists in the microcosm, then the reverse must also be true: that everything that exists in the microcosm exists in the macrocosm. This can have profound implications. But first let us look at some various examples of this law at work. In Ayurveda, perhaps the most well-worn application of this law is in the elemental macro and microcosms. Herein there are five elements (earth, water, fire, air and ether) and three governing forces—or doshas (Vata, Pitta and Kapha). Vata represents movement, Pitta transformation and Kapha structure. The same five elements and three doshas make up the universe and human beings. They act in the same manner in both. For example, in the fire of summer we may have more of a tendency to suffer from internal firey conditions, such as ulcers, anger or skin rashes. The macrocosm of the planetary environment is affecting the microcosm of the human environment. The microcosm affecting the macrocosm is expressed in the now famous example of the butterfly flapping its wings in one part of the world and this affecting whether patterns on far away continents. Sometimes clearly expressed and at other times subtle or difficult to perceive, the Law of Macrocosm and Microcosm is nonetheless a fundamental principle in Ayurveda. While not as frequently evoked as our elemental macro and microcosms, there are also temporal microcosms and macrocosms. In these, each time cycle is a microcosm of the next. There is the 24 hour cycle of night giving way to daytime. This daily rhythm goes on and on and on, mimicking the grander cycles. The cycles of years, where the winter with its cold, lifeless months melt into the new growth of spring. The cycles of a lifetime, where a man goes from death into birth and from birth again into death. The cycle of 8.4 million births and deaths before the soul arrives in the human body with its golden sun of the opportunity to return to the Divine. The cycle of yuga upon yuga moving from dissolution into manifested reality. While we may have little or no control over the grander cycles of the yugas, the 84 lakhs, our birth into the human body and the yearly seasonal cycles, we have a chance every morning to take advantage of the cycle of the new day. If this law of Macrocosms and Microcosms is valid, then it stands that we can affect the macrocosm of a lifetime via the microcosm of a 24-hour cycle. O traveler get up; it is dawn-it is not right that you continue sleeping. One who awakes, he finds, One who is asleep, he loses. Get up and open your eyes from slumber and meditate on your Master. The End of a Lifecycle. 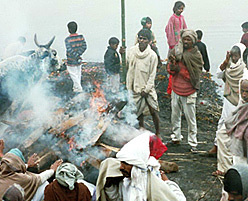 Cremation at Harischandra Ghat in Benares in December ’01. photographed by Dr. Claudia Welch. Brahmamuhurta is part of the 24 hour time cycle. If we overlay this 24 hour cycle microcosm over the cycle of a lifetime, we would see that brahmamuhurta roughly corresponds to (at least) late pregnancy and birth in the lifecycle. Childhood would correspond to morning, midlife to midday, old age—or the twilight of life—to late afternoon through twilight, death to the fall of the night and the unembodied soul to the nighttime. While we could look at any one of these corresponding time pairs, we are interested here in the particular importance of Brahmamuhurta as it relates to pregnancy and birth. If the former is in fact the microcosm of the latter, we would suspect that there would be some deep similarities between the two. And indeed there are. One striking similarity is that both times are governed by Vata. In Ayurveda, Vata, Pitta and Kapha are each said to govern certain times of day or times of life. Of the three, Vata governs all sandhis, or joints, such as the transitions from birth to death, death to birth, day to night and night again into day. Vata governs the hours of 2am through 6am, or through dawn, which we know embraces the “joint” of night into day and encompasses brahmamuhurta. Apana, one of the five subsets of Vata, becomes particularly active around dawn. Prana, another one of the five subsets of Vata, is that mystical and practical intelligence responsible for assembling a baby’s cells, tissues and organs during pregnancy. It controls the way a body is put together and how it functions once it is assembled. The same Apana that is active during dawn is also responsible for successfully delivering the baby into the world. So we can see that the same force—Vata—is dominant during both time cycles. If the healthy functioning of Prana assures optimal organization of energy and physical matter in the developing person, and healthy Apana delivers the complete person into the world in an optimal manner, then it goes to follow that these principles apply to the microcosm of brahmamuhurta as well. During the early morning hours, for example, the active Prana would be organizing the intelligence of our physical and mental stotas or pathways, as it does during pregnancy and delivery. Healthy Apana would allow us smooth entry into our day. It would also stand to reason here that damaging or healing influences on Prana, Apana and the other subsets of Vata would be particularly significant during brahmamuhurta, as they are during pregnancy and birth. 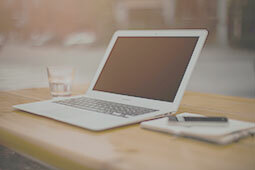 We may take advantage of the fact that the organizational and delivery principles are particularly active, available and subject to influences at this time and we can provide healthy influences. Healthy influences would be any that would pacify Vata and facilitate the free flow of Prana. There’s a worm addicted to eating grape leaves. That doesn’t need to devour. Vata, by nature, is easily affected by influences—both positive and negative. If the mother is calm and healthy during pregnancy, Vata and its subsets function optimally and the fetus’s development and birth progress in a healthy manner. If Vata is disturbed during pregnancy and/or birth, the life of that new human being may be negatively affected. It is recognized in Ayurvedic medicine, Chinese Medicine, even Western medicine, that such trauma or discomfort may have a negative impact on our physical, mental and emotional patterns throughout our lives. In his Textbook of Ayurveda: Fundamental Principles, Dr. Vasant Lad writes that, during pregnancy, “the mother’s diet, lifestyle, environment, and mental/emotional states” influence and even alter the growing baby’s lifelong constitution. So, influences during pregnancy and birth may affect a person’s entire life. Does this mean that something we had no control over as a developing fetus, or an infant, will negatively affect us for the rest of our lives? That perhaps our ability to have intimate relationships, to trust, to digest physical or emotional experiences is forever and unalterably afflicted? It was the opinion of Sant Ajaib Singh ji Maharaj, my Guru ji, that there is always hope for change and healing. He told me “a doctor should always think that he will be able to find the goodness; he will be able to find the cure of the pain of the person.” My Guru didn’t tell me that there were certain conditions that were impossible to treat. He told me that the outcome of a treatment was not my concern; that was in the hands of God, but that it was our job, both as doctors and patients, to make the efforts. I have searched, therefore, to find a way to access healing in these sometimes difficult cases. I have been exploring utilizing brahmamuhurta to do this in my practice, with some success. We have seen that there is a window from the microcosm of brahmamuhurta to the macrocosm of our life in utero and delivery. It may be through this window that we have an opportunity to reformat those early patterns and thereby begin to heal negative changes that took place during that time. Each new morning we have another opportunity to establish healthy pathways that will either replace the negative ones created during our pregnancy or birth, or to reinforce the positive ones that may have been created. Each new day ushers in a cascade of new possibilities and a shower of second chances. The saints have told us how to take advantage of these hours. They have told us to lovingly meditate in these hours. Whenever my Guru ji would put us in meditation in these hours he would say “Never understand meditation as a burden. Always do it lovingly.” As with anything the saints say, there are secrets to this that go deeper than the obvious meaning. The obvious meaning here is that love and longing pull us closer to the Divine, while doing sadhana as a chore may render it little more than an exercise. However, it is possible that approaching our sadhana with love can also aid our physical, mental, emotional well-being and serve to reformat negative patterns that may have been established in utero or during birth. This loving attitude will exert a healing influence on the Vata that is predominant during brahmamuhurta and the relaxation will allow for the smooth flow of Prana. Prana is the equivalent of “Qi” in Chinese Medicine and martial arts and it is well known in these paradigms that qi can not flow if the practitioner or patient is not relaxed. This is also a common understanding in the practice of hatha yoga: that if the practitioner is not relaxed, prana will not be able to flow. So, if we are tense and result-oriented or rushed while we do our spiritual practices in the morning, the qi or prana cannot flow and this results in disturbance in the body, mind or spirit, where prana flows. On the other hand, if we are so relaxed that we sleep through these hours, we encourage tamas, or the force of inertia in our lives, to create obstacles to the free flow of prana. It would seem therefore, most beneficial to follow the advice of the saints and spend brahmamuhurta meditating or doing our spiritual practices, in an alert, loving, relaxed manner. Guru Arjan Dev Ji Maharaj says, “always go on remembering Him, and every morning rise up early and make the efforts. Take the food of the devotion of Lord Almighty, then you will have no difficulties at all.” Guru Arjan dev did not just say that this will better our spiritual life. He said that we will have “no difficulties at all” if we can take this “food” in the morning. When we meditate lovingly during brahmamuhurta, we are able to accept nourishment or food of the Lord in the same way that we might have received sustenance during our in utero and birth experience. We pacify Vata, Prana flows freely, our mental and physical apparatus becomes well organized and we are delivered into the new day as a healthy individual. And perhaps, as we have seen, we are healing the relative macrocosm of our in utero and birth experience at the same time, thereby benefiting our entire life. Now, if the microcosm of our lifetime can be lovingly affected, then perhaps the macrocosm of even yugas will be positively affected. I will sell thee, O sleep, If a buyer I find. Sleep, my archenemy, I’ll surely sell thee. I will put thee on sale. For five pounds will do. Only a rupee I’ll take. Thou art my most deadly foe. Begging the buyers to come. For payment at some distant date. Will I set high my stall. And effect a rapid sale. Have I wasted my days. And lost ale my fortune. All thy tricks I know. There is no room for thee. Lad, Vasant, M.A.Sc. Textbook of Ayurveda: Fundamental Principles. The Ayurvedic Press. 2002. Sethi, V.K. translator. The Divine Lover. Published by Radha Soami Satsang Beas. 3rd edition 1996. Svoboda, Robert E., Ayurveda: Life, Health and Longevity. Penguin Books. 1992. Vagbhata. Translated by prf. K. R. Srikantha Murthy. Astanga Hrdayam. 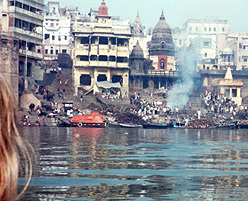 Krishnadas Academy, Varanasi. 1991. Watch an excerpt from the Foundations of Āyurveda Part I online course. "This course is perfect. Genius. And love. Thank you ever so much." Please request technical support here. Looking for an intensive, in-depth foundation in Ayurveda, that you can do in your pajamas, on your own schedule, with tea? 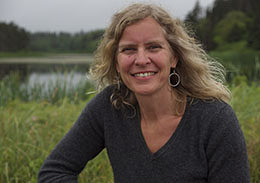 We invite you to consider our online courses, "Foundations of Ayurveda" Parts I and II, co-taught by Dr. Claudia Welch & Dr. Robert Svoboda. 100+ hours of video, handouts, quizzes, & certificates. 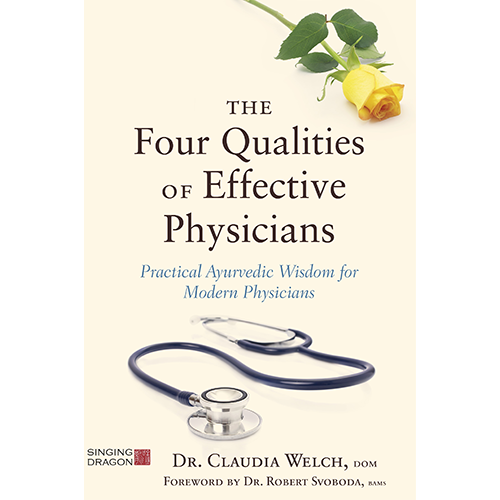 Dr. Claudia Welch is a Doctor of Oriental Medicine, an Ayurvedic practitioner and educator. Her books, CD's and a wealth of other resources are available via this website. Any courses taken on this website can count towards NAMA requirements.